I always thought that U.S. universities put a high emphasis on school spirit with their mascots, cheerleaders, teams, etc. 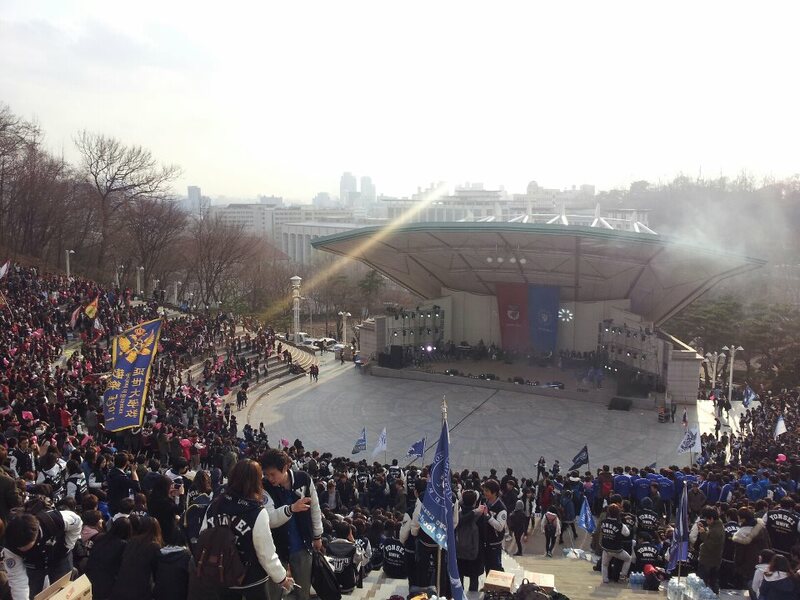 but I’ve never seen anything even close to the spirit Yonsei has. It is UNBELIEVABLE! Everyone wears their fancy Yonsei jackets through the whole city with much pride and they display their love for the school they go to (students of other universities in Seoul do the same). The most impressive display of school spirit and pride, however, has to be the Akaraka and Cheering Competition. I have never seen students so involved and so happy to be part of a certain university. 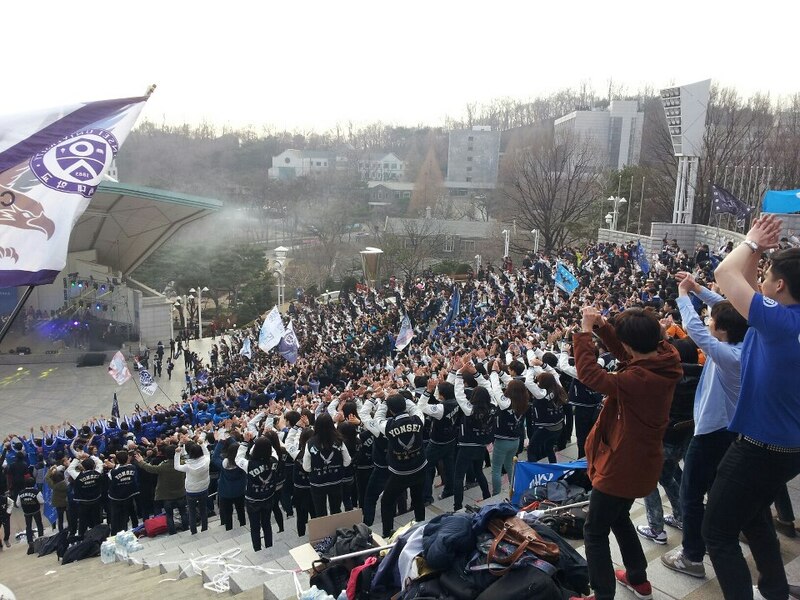 In some of my earlier posts I wrote about how Yonsei and Korea University are two main rivals and they have all these amazing cheering songs where they talk about which school is better and how they are going to beat the other school. As part of our international student orientation we had an hour long cheering orientation during which we learned (or tried to learn) all the cheers and dances. It is really hard as the vast majority of the songs are in Korean so it’s very hard to follow. Dance, on the other hand, is much easier to follow as you just do what everyone else is doing. Even though the school spirit is on such a high level, the University sports are not that good on this level. 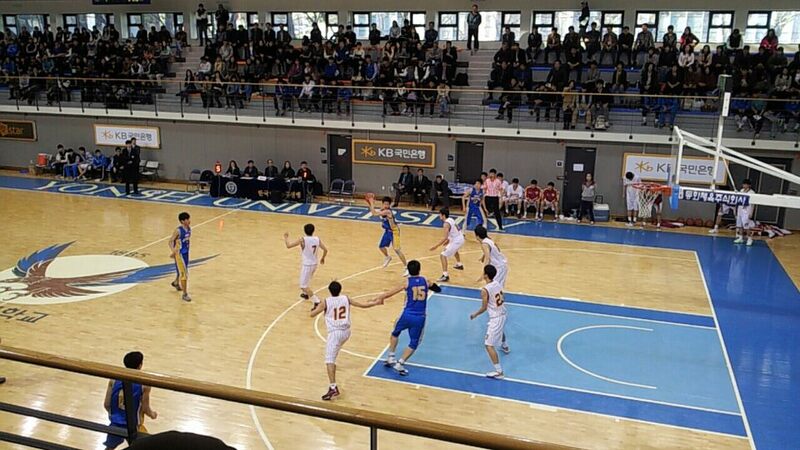 Two of my friends and I went to a home basketball game between Yonsei and another Korean university and I was rather surprised to see how few supporters there were and the program was not on the level I would have expected. There were no cheerleaders at all! It was interesting to have this event and cheering competition and to compare them in my mind. We, however, enjoyed a good basketball game! Now, I’ll leave Yonsei for a while to go and visit an island located about 1.5 hours from Seoul and I am really looking forward to exploring Korea! This entry was posted on Monday, April 15th, 2013 at 3:27 pm and is filed under Indira in South Korea, Spring 2013. You can follow any responses to this entry through the RSS 2.0 feed. You can leave a response, or trackback from your own site.